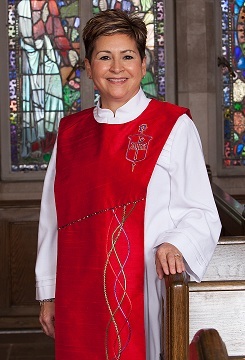 LAKE JUNALUSKA, N.C. (UMNS) — Bishop Cynthia Fierro Harvey will be the next secretary of the Council of Bishops. Harvey was elected to the position by the council’s active bishops on Nov. 13 during their recent gathering at Lake Junaluska. Harvey has served as bishop of the Louisiana Conference since September 2012. She will be taking on the role as a parliamentarian and as an organizer who helps keep Council of Bishops gatherings on course. She succeeds Oklahoma Area Bishop Robert E. Hayes Jr., who served three terms as the council’s secretary. Bishop Warner H. Brown Jr., who leads the California-Nevada Annual (regional) Conference, will be the next president of the Council of Bishops. The council’s active bishops also elected Dakotas-Minnesota Area Bishop Bruce R. Ough as the president-designate. By majority vote, they also elected Ohio West Area Bishop Gregory V. Palmer — a former Council of Bishops president — to deliver the episcopal address during the next General Conference. The denomination’s top lawmaking assembly will convene May 10-20, 2016 in Portland, Ore.
Brown will take office in May 2014, and Ough will receive the gavel during the 2016 General Conference. Harvey will begin her two-year term next summer.